Virtually all central heating and air conditioning systems are controlled by a low-voltage thermostat that tells the system when to turn on and shuts it off when the house temperature has reached the desired level. These thermostats are called low voltage because they run off a transformer that reduces line voltage from 120 volts to a level somewhere between 12 and 24 volts, depending on the brand of furnace you own. When an HVAC (Heating, Ventilation, Air Conditioning) system doesn't work quite as it should, very often it can be traced to a problem with the thermostat. Because these are easier to fix, the thermostat is the first place to look for problems. If the trouble is not there, then the problem may be in the furnace itself. If the HVAC system fails to turn on at all, there are a number of thermostat problems that should be considered before assuming the furnace or AC unit is to blame. In many cases, this symptom is the result of no electrical current reaching the thermostat. Reset circuit breaker or replace burned out fuse. Remove thermostat cover and gently clean components, especially the bimetallic coil and the switch contact surfaces. Set the thermostat to its lowest setting and clean the bimetallic coil with a soft brush or compressed air. Set the thermostat to its highest setting and clean the coil again. Then, reset the thermostat to its desired setting. Tighten any loose screw terminals. If a wire is loose from its terminal, place the wire back on the terminal clamp and tighten the screw. Check for loose connections or disconnected wires on a low-voltage transformer, which is usually mounted on the furnace. On electronic thermostat models, check to see if the display is working, indicating power. If it is not working, replace the batteries in the thermostat. Sometimes the furnace/AC system will run, but will fail to set the temperature to the level you've chosen. 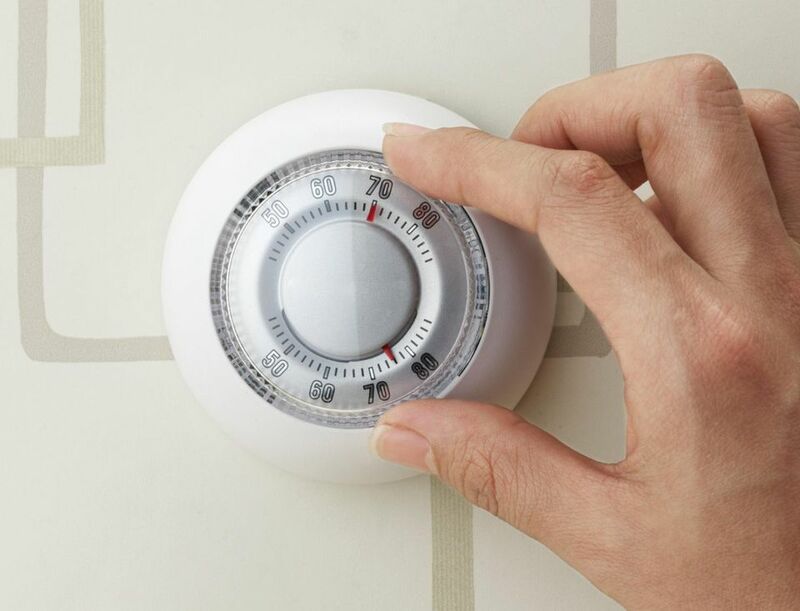 Remove the cover of the thermostat and loosen the screws that hold the unit to the wall. Level the thermostat, then retighten the screws and replace the cover. If a furnace/AC system turns off and on again frequently—a symptom known as short-cycling—it is usually because the electrical connections within the thermostat are not making clean, consistent contact. Be aware, though, that when outside temperatures are radically higher or lower than the desired indoor temperatures, it is normal for the HVAC system to cycle fairly frequently. On a bitterly cold winter's day, for example, your furnace may start and stop quite often.